Wedding rings have long been a tradition in marital ceremonies and have been used to symbolize the lasting commitment between the bride and groom. This idea originated centuries ago in Europe, where the wedding band would be worn on the base of the left ring finger as a display of their dedication to one another. There is a number of variations to these fundamental traditions. Some may engrave the name of their spouse and the date of marriage on the ring while others may wear the wedding and engagement ring as an accompaniment to other pre-engagement rings. These rings together all intended to symbols of their lasting devotion. No matter the details of one’s marriage, it is most likely that a wedding ring is in order. Finding and purchasing the perfect ring can be an exciting yet overwhelming endeavor. Everyone has the same ultimate goal of finding the ideal wedding ring. The best way to approach the wedding ring search is to follow a set of rules and series of steps. The first item to keep in mind is the type of metal of which the ring is constructed. There are several options including yellow, white, and rose gold, platinum or palladium. Some rings are available in a multi-tone design in which two types of metal are incorporated into the ring. The second option to consider is style, this can range from vintage design to more contemporary settings, and one should have a general idea of what ring style is most desirable. There are other details to consider when purchasing a ring, as well. For instance, some rings may have a pattern cut into the band while other may have diamonds incorporated into the design. Also, certain qualities such as the thickness of the band and available sizes need to be considered when evaluating each ring. Working through this method step by step will help narrow down the perfect ring. Some people opt for a culture specific ring, or one that specifically honors their family and heritage. One particular culture, which retains a strong presence in its wedding traditions, is the Scottish culture. A major aspect of Scottish weddings is, in fact, the design of the ring itself. They are designed not only to be symbolic of the commitment between husband and wife but also loyalty to the family and demonstrate ties to ancient heritage. These symbols can include those that are indicative of the family lineage, regional allegiance and of course the overall Scottish tradition. Many couples and families who have a strong Scottish background opt for a traditional Scottish wedding ring. The question then becomes, which ring is best suited for the union of man, wife and family. The Celtic culture still remains a large presence in present day Scotland. These rings are characterized by a Celtic knot design. This design can either be engraved or embossed on the band or woven into the ring itself. This knot is designed to signify both unity and continuity as the couple comes together from separate origins to become one. Sometimes these knots can be embellished or stylized to contain other elements. These may include stones set into the band along with the knot or another pattern engraved into the knot to add extra flair or even additional symbolism. These rings are exceptionally straightforward, in overall appearance. Usually, they are crafted of yellow gold. The price, depending on the quality and karat of gold is usually established around $200. If there are additions, such as a diamond or other details the price will increase. Also, if, a more expensive metal is used to craft the ring the ring cost will rise, as well. This type of ring is best suited for extremely traditional families. These rings are typically unadorned bands of some metal. Some of these bands may be more decorative than others. On it is often embossed or engraved ancient Celtic runes. If customizing the ring, the couple can choose what they wish the rings to say. Traditionally, these rings will have a rune that translates into something similar to “love, loyalty and friendship.” This look adds a lovely traditional Scottish look to the wedding rings. Other options similar to this are the engraving of Celtic imagery or artwork onto the band. Each image represents a powerful symbol in Scottish tradition and can be tailored to represent what the couple wishes their marriage to represent. Depending on the material and design from which these rings are constructed their price can range anywhere from $100 up to $1,000. They are an excellent choice for any couple looking to add a unique flair to their wedding rings and uphold a strong sense of Scottish tradition in their marriage. These rings bear the seal or crest of the family clan. The represented crest is, typically, that of the bridegroom. It is adopted by the bride in their union. Each crest is unique. It is designed to represent the aspects of the clan that they deem most significant. Most of these seals have been around for centuries and are honored in most traditional Scottish families. This is often used as a Scottish wedding ring because it is symbolic of the union of two families through the love of the bride and groom. These rings typically come in two forms. The first form is a more contemporary variation of the family crest ring. In this design, the family crest is embossed on the surface of the ring. In a more traditional version, the crest is imprinted in reverse so that it can serve as a seal ring, as well. Since this tradition has died out over the centuries, the only practical purpose of this type of ring is to emulate a more traditional appearance, as in ancient times all crest rings would have been reversed. These rings are also available in a variety of sizes, large crest or small, to suit ones specific tastes. Since these rings do require some customization, they can be a little pricier than other traditional Scottish rings, unless one finds a vendor who already makes and carries the family crest of interest. The cost can be as much as $300, depending on the metal used in creating the ring. Another type of ring that is characteristic of Scottish tradition is the enamel ring. These are rings designed after traditional Celtic styles and designs. These types of rings were typically worn by the royal and wealthy classes. The rings that are available today are mostly replicas that emulate this style, since most rings that remain from that period are considered rare and are preserved in museums and other such venues. These rings bear the classic colored enamel of ancient Celtic rings. These come in a variety of colors some of which are blended to create beautiful and unique looks. They come set in a variety of ring designs bearing classic Celtic styles and can be set in nearly any jeweler’s metal. These rings do not bear as much symbolism as other Scottish wedding rings but still to carry the essence of traditional rings. The major benefit to these rings is the price. Most enamel rings are under $100. They are a beautiful alternative to gem stones, for those on a tighter budget. It is always beneficial when purchasing rings to keep ring sizing in mind. With traditional Scottish rings that are crafted today, most are probably available in any size necessary. However, if, one wishes to purchase or inherit an existing ring, it is best that one researches whether or not the ring is designed to be re-sized if necessary. In some cases, a vendor will not re-size a ring that they sell even if the design and material permits. In this case, it is best to purchase the ring and take it to an alternate jeweler and have it sized properly. Be sure to research and verify all this information prior to making a final purchase. The first priority in any prospective buyer’s mind is merely finding the perfect ring for their wedding day. If one opts for a traditional Scottish design, there are a number of places to begin searching. 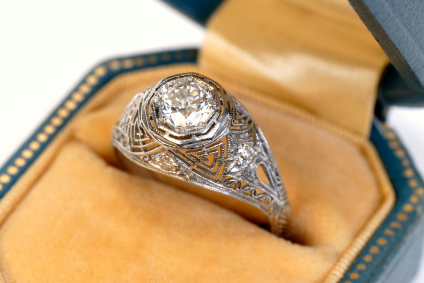 Some antique ring dealers may carry older, more authentic rings, in their collection. However, there are a number of vendors online, which offer a wide selection of traditional Scottish ring designs. This is perhaps the best place to start gathering information on what options are available to betrothed couples. It is also necessary to decide if the bride and groom wish to have matching or coordinating wedding bands because this may limit the options or potential choices available. One’s wedding ring is a truly unique item that is incredibly symbolic. In Scottish tradition, the symbolism extends beyond that of the union of man and wife, but also represents the loyalty to family and what the relationship means to the couple. There should be a terrific deal of research and care put into the selection and purchase of the ideal ring. Finding one that is suitable and likeable is incredibly valuable. Though the task may be grueling, the effort is certainly well spent. When searching for the perfect Scottish ring implement an organized search process. By doing so, it will, eventually, identify the ideal wedding ring. I am interested with the Celtic Ring and would like to order a new one (with modification, probably change to ruby stone) for my proposal. Can you leave me contact.